How Do your Characters Shake Hands? Handshakes communicate dominance, submission, or equality. When hands meet, if one person turns his or her palm facing down, it’s called the Upper Hand and means that person wants control of the meeting. The submissive handshake is from the person whose palm faces upward. In social situations, women often offer a soft handshake to men showing femininity and that they will let the man be in control. Women who use firm handshakes reveal they are open to new ideas. Two people who keep their palms in the vertical position create equality and mutual respect. The pressure of a handshake is considered in the same categories. Equal pressure from each person is the ideal and during the handshake, it can be adjusted. For instance if one person is using less firmness, the other person can reduce the pressure to match. Male hands can exert more power compared to the average female hand. A male who desires equality would make adjustments for her and a woman would increase pressure if she realizes he will be stronger. 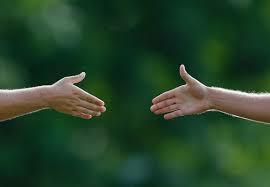 Handshakes last a short time but reveal information whether people are aware of it or not. When writers include characters’ handshakes in a scene, a discerning protagonist can let the reader know the other character’s intentions. The writer has another tool for showing body language. Jill in my novel, Norman in the Painting, knows everyone in the small town where she lives. She hasn’t had the opportunity to shake hands with a stranger yet. If she did meet someone for the first time in the early pages of the book, I would make her handshake a submissive one. Later, as she develops confidence, I’d change her handshake to a firmer one. I’m in the process of writing a novel and editing two others. Two of them take place in Greece between 1820 and 1912. In both cases a woman (my protagonists) wouldn’t shake hands with anybody. For one I’m editing this tip will be helpful. Wounded Mary will have a limp, reluctant handshake. Maybe at the end she will firmly and equally shake her newly accepted stepson’s hand, then pull him into a hug. Great. I’m glad the tip is something you can use.